When Douglas Adams passed away in his literate prime, the world lost a great humorist. One of his best characters, Zaphood Beeblebrox, to try to bring him some humility, was placed in a peculiar chamber, the Total Perspective Vortex. While in the chamber, he was oriented and scaled in position relative to everything in the known universe. The idea being anyone who needed a little humbling would see their true place in the Cosmos, would see the vastness of Infinity. The individual would then come to fathom they are less than a dust mote on a grain sand on some backwater planet, rather than a great manifestation of ego represented by the trappings of being a carbon-based (or silicon, or whatever) life-form. Rather than finding this experience humbling and gaining new, perhaps a more altruist perspective, Zaphod interpreted exposure in the TPV to mean he was the most important thing in the universe. I have always found this image (left) to be extremely humbling, and have used the mental image to help keep life stresses in perspective. And, the image does communicate geography, too; as the image communicates both site and situation, therefore meeting the definition of geography. This is not an image of our galaxy, by the way, but a galaxy similar to ours. Obviously, the satellite needed to have taken this picture had this been our universe, would needed to have been launched millions of years ago, and I don’t care what Energizer says, eventually the batteries would have wore out before the satellite ever reached this position. Now, the new issue of Scientific American has a new image. The image above is missing the “You Are Here” label [pretend it is in the top-right quadrant]. 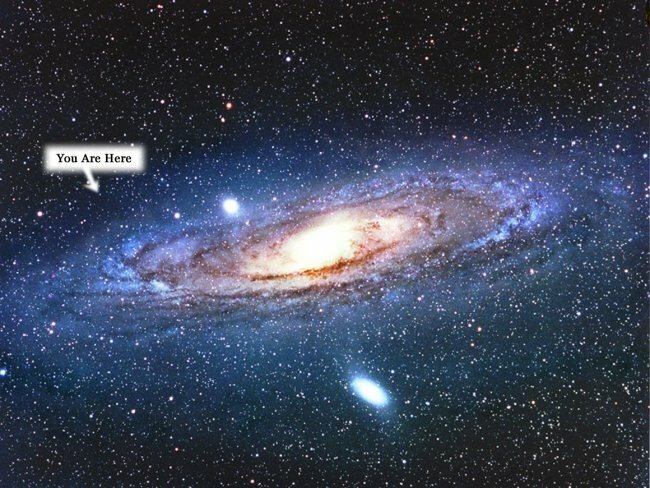 Again, another humbling image of our universe / space-in-our-general vicinity. Authors of the article set forth the notion that, while Copernicus may have been right about the earth circling the sun (silly early Christians, and some silly contemporary Christians), we may be wrong in thinking that we orbit in a normal bit of space. If we adjust our perspective, and place our position close to a void in space, perhaps near the center of the universe (which, indeed might be special after all) we might be able to explain Dark Energy. Site and Situation, on a Cosmological scale.